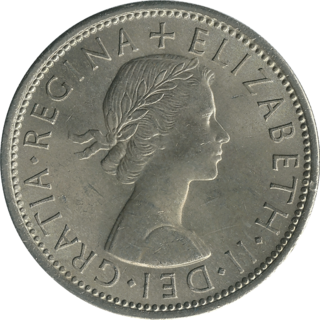 Prior to decimalisation in 1971, there were 12 pence (written as 12d) in a shilling (written as 1s or 1/-) and 20 shillings in a pound, written as £1 (occasionally "L" was used instead of the pound sign, £). There were therefore 240 pence in a pound. For example, 2 pounds 14 shillings and 5 pence could have been written as £2 14s 5d or £2 14/5. The value of some coins fluctuated, particularly in the reigns of James I and Charles I. The value of a guinea fluctuated between 20 and 30 shillings before being fixed at 21 shillings in December 1717. 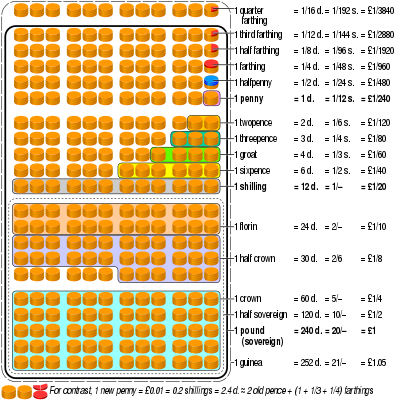 These are denominations of British, or earlier English, coins – Scottish coins had different values. Farthing ​1⁄4d £0.00104167 c. 1200–1960. The word "farthing" means "fourth part" (of a penny). Halfpenny ​1⁄2d £0.0021 1272–1969. Often called a "ha'penny" (pronounced HAY-p'nee), plural halfpennies ("ha'pennies") for the coins, halfpence ("ha'pence") for the monetary amount. Three farthings ​3⁄4d £0.0031 1561–1582. Three halfpence ​1 1⁄2d £0.0063 1561–1582, 1834–1870. see note 1 below. Pronounced as "three-ha'pence"
Half groat 2d £0.0083 1351–1662. Twopence 2d £0.0083 silver (inc. Maundy) 1668–current; copper 1797–1798. Pronounced "tuppence". Threepence 3d £0.0125 silver 1547–1945 (and thereafter only for Maundy), nickel-brass 1937–1970. Sometimes called "thripp'nce", "thrupp'nce", "threpp'nce" or "thripp'ny bit", "thrupp'ny bit". Referred to as a "joey" after the groat was no longer in circulation, as seen in George Orwell's Keep the Aspidistra Flying. Groat 4d £0.0167 silver 1279–1662, 1836–1862 (and thereafter only for Maundy). Referred to as a "joey" after Joseph Hume, the economist and Member of Parliament until it stopped being issued in 1885. Sixpence 6d £0.025 1547–1970; circulated from 1971 to 1980 with a value of two and a half decimal pence. Also called "tanner", sometimes "tilbury", or "joey" after the groat was no longer in circulation. Shilling 1/- £0.05 1502–1970, circulated from 1971 to 1990 with a value of five decimal pence. Also called a "bob", in singular or plural. Gold penny 1/8 to 2/- £0.0833 to £0.1 1257–1265. Gold. Undervalued for its metal content and extremely rare. Quarter noble 1/8 £0.0833 1344–1470. Quarter angel 2/- £0.1 1547–1600. Gold. 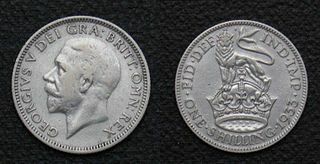 Half crown 2/6 £0.125 1526–1969. Sometimes known as "half a dollar" (see Crown below). Half angel 3/4, later 5/6 £0.1667, later £0.275 1470–1619. Crown of the rose 4/6 £0.225 1526–1551. Crown 5/- £0.25 1526–1965. Sometimes known as "a dollar" – from the 1940s when the exchange rate was four USD to the GBP. Quarter guinea 5/3 £0.2625 1718, 1762. Noble 6/8, later 8/4 £0.3333, later £0.4167 1344–1464. Increased in value in 1464. Half mark 6/8 £0.333 [medieval period] A unit of account, not a coin. Convenient as it was exactly one-third of a pound. Third guinea 7/- £0.35 1797–1813. Rose noble or ryal 10/-, later 15/- £0.5, later £0.75 1464–1470, 1487, 1553–1603. Increased in value from 1553. Half sovereign 10/- £0.5 1544–1553; 1603–1604; 1817–1937 A bullion coin since 1980. Double crown 10/- £0.5 1604–1619; 1625–1662. Half laurel 10/- £0.5 1619–1625. Half unite 10/- £0.5 1642–1643. Half guinea 10/6 £0.525 1669–1813. Mark 13/4 £0.667 [medieval period] A unit of account not a coin, but widely used. Spur ryal 15/- £0.75 1604–1625. Sovereign 20/- £1 1489–1604; 1817–1937 A bullion coin since 1957. Unite 20/- £1 1604–1619; 1649–1662. Carolus 20/-, later 23/- £1, later £1.15 reign of Charles I. Guinea 21/- £1.05 1663–1799, 1813. Rose Ryal 30/- £1.50 1604–1625. Two pounds 40/- £2 1823–1937. Two guineas or double guinea originally 40/-, later 42/- originally £2, later £2.10 1664–1753. Originally known as a "forty-shilling piece"; value changed to forty-two shillings after the Proclamation of 1717 finally settled the value of a guinea. Fifty shillings 50/- £2.50 1656. Triple unite 60/- £3 1642–1644. Five pounds 100/- £5 1826–1990. Gold. Five guineas originally 100/-, later 105/- originally £5, later £5.25 1668–1753. Originally known and valued as five pounds, but became five guineas when the guinea was standardised at one pound and one shilling in 1717. Denomination issued for use in the colonies, usually in Ceylon, Malta, and the West Indies, but normally counted as part of the British coinage. The medieval florin, half florin, and quarter florin were gold coins intended to circulate in Europe as well as in England and were valued at much more than the Victorian and later florin and double florin. The medieval florins were withdrawn within a year because they contained insufficient gold for their face value and thus were unacceptable to merchants. Since decimalisation on "Decimal Day" in 1971, the pound has been divided into 100 pence. Originally the term "new pence" was used; the word "new" was dropped from the coinage in 1983. The old shilling equated to five (new) pence, and, for example, £2 10s 6d became ​£2.52 1⁄2. The symbol for the (old) penny, "d", was replaced by "p" (or initially sometimes "np", for new pence). Thus 72 pence can be written as £0.72 or 72p; both were commonly read as "seventy-two pee". Half penny £0.005 ​1⁄2p Sometimes written "ha'penny" (pronounced HAY-p'nee), but normally called a "half-pee"; demonetised and withdrawn from circulation in December 1984. Five pence £0.05 5p A direct replacement for the shilling. The coin was reduced in size in 1990. Six pence 6p Introduced in 2016 as a commemorative coin. Ten pence £0.10 10p A replacement for the florin (two shillings). The coin was reduced in size in 1992. Twenty pence £0.20 20p Introduced in 1982. Twenty-five pence £0.25 25p or "crown" A commemorative coin issued between 1972 and 1981 as a post-decimal continuation of the old crown. From 1990 it was replaced in the commemorative role by the £5 coin. Fifty pence £0.50 50p Introduced in 1969, just prior to decimalisation, to replace the ten shilling note ("ten bob note"). It was initially sometimes called a "ten bob bit". The coin was reduced in size in 1997. One pound £1 Introduced in 1983 to replace the one pound note. Two pounds £2 Issued as a commemorative coin from 1986 and in general circulation from 1998 (dated from 1997). Five pounds £5 or "crown". Introduced in 1990 as a commemorative coin, replacing the commemorative role of the twenty-five pence coin. Britannia, sovereign and half sovereign Bullion coins issued to various values. Twenty pounds £20 Introduced in 2013 as a commemorative coin. Fifty pounds £50 Introduced in 2015 as a commemorative coin. One hundred pounds £100 Introduced in 2015 as a commemorative coin. Main articles: Banknotes of the pound sterling and Bank of England note issues. Note: The description of banknotes given here relates to notes issued by the Bank of England. Three banks in Scotland and four banks in Northern Ireland also issue notes, in some or all of the denominations: £1, £5, £10, £20, £50, £100. Ten shilling note 10/-(£0.5) N non-circulating Originally issued by the treasury in 1914. Replaced by Bank of England notes from 1928. Commonly known as "ten bob note" or "half a quid". 1914–1970. £1 note £1 N non-circulating Withdrawn in 1988, it is still issued by the Royal Bank of Scotland, Bank of Ireland and still used in some of the Channel Islands. £5 note £5 Y in circulation The original "large white fiver" five pound note was known as "five jacks" and replaced in 1957 by the blue £5 note. Now also known as a "fiver". £20 note £20 Y in circulation Also known as a "score". £50 note £50 Y in circulation Also known as a "bullseye". £100 note £100 N not in circulation Issued by Scottish and Northern-Irish banks only. £1,000,000 note £1,000,000 N non-circulating Used as backing for banknotes issued by Scottish and Northern Irish banks when exceeding the value of their 1845 reserves. The amount to be covered is over a billion pounds. Also issued in 1948 as a temporary measure during the postwar reconstruction in the Marshall Plan. £100,000,000 note £100,000,000 N non-circulating Used as backing for banknotes issued by Scottish and Northern Irish banks when exceeding the value of their 1845 reserves. The amount to be covered is over a billion pounds. Bank of England notes are periodically redesigned and reissued, with the old notes being withdrawn from circulation and destroyed. Each redesign is allocated a "series". Currently the £20 and £50 notes are "series F" issue whilst the £5 and £10 notes are "series G" issue. Series G is the latest round of redesign, which commenced in September 2016 with the polymer £5 note and September 2017 with the polymer £10 note. The series G polymer £20 note will be released by 2020. ^ Lara E. Eakins. "Coinage". tudorhistory.org. Retrieved 22 June 2014. ^ Francis Sellon White (1827). A History of Inventions and Discoveries: Alphabetically Arranged. C. and J. Rivington, London. Retrieved 22 June 2014. ^ Samuel Maunder (1841). The Scientific and Literary Treasury; A New and Popular Encyclopedia of the Belles Lettres. Longman, Orme, Brown, Green, & Longmans. Retrieved 22 June 2014. ^ "Slang Terms for Money". ^ "£20 Coins". The Royal Mint. ^ "£50 Coins". The Royal Mint. ^ "Buckingham Palace 2015 UK £100 Fine Silver Coin". Royal Mint. Retrieved 12 August 2015. ^ a b "Scottish and Northern Ireland Banknotes - The Role of Backing Assets". Bank of England. Retrieved 26 September 2013. ^ "One in a Million". Time. Retrieved 13 April 2018.